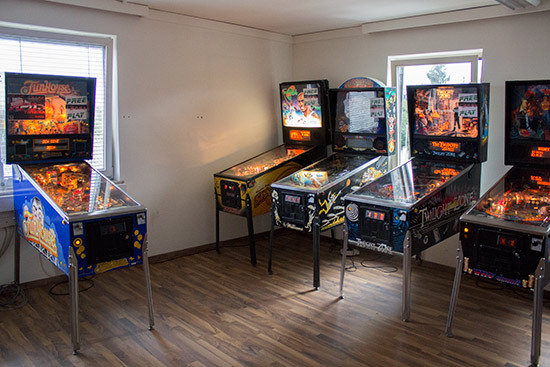 Location: Hall of Pinball-Fame, 12 Badendorf, Badendorf 8413, Austria. 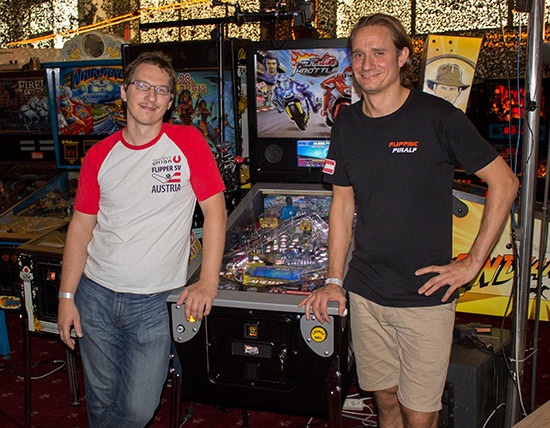 Our report from last year's Austrian Pinball Open by Stefan Riedler and Gabor Varga certainly looked as though everyone had a great time. So when Stefan asked if we would like to come to this year's APO, we didn't have to think about it too hard. 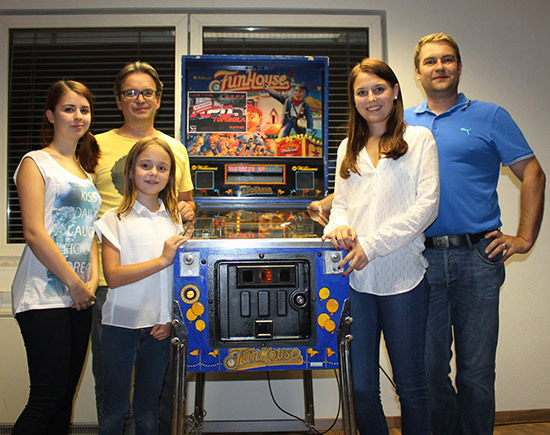 Our two hour flight landed in Vienna mid-afternoon on Friday, and after a two-hour drive to the city of Graz and a rapid check-in at the hotel, we were back in the car and heading to the village of Badendorf where the Hall of Pinball-Fame is located. 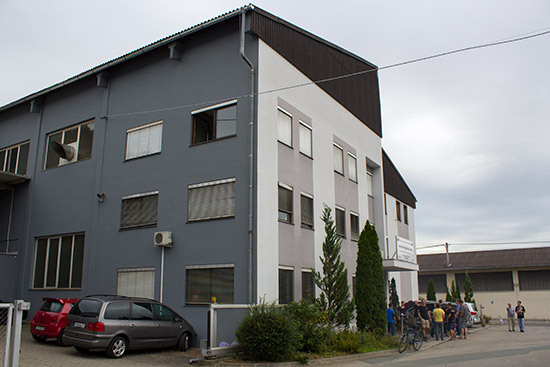 The venue was a modern, if unexciting-looking office block on a light-industrial estate. 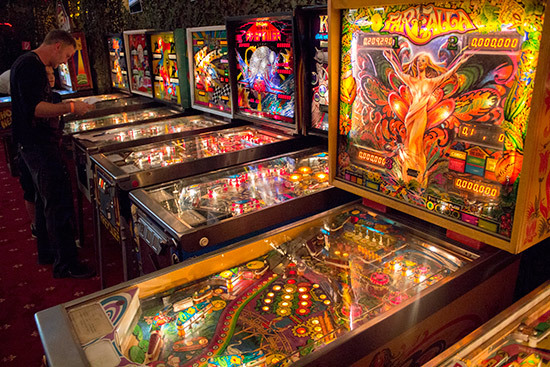 But it was easily identified by the pinball smokers congregating outside and the sound of flipping flippers coming out of the open windows. By the time we arrived it was 8pm and dark outside. 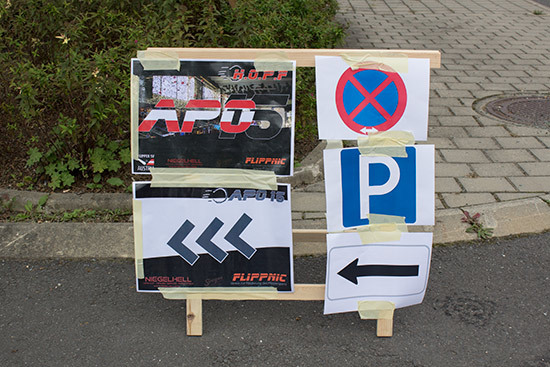 The main APO tournament didn't start until Saturday morning, but there was a warm-up tournament on Friday night which was due to start at 8pm, so we quickly rushed inside to sign up. We needn't have worried though, as it soon became apparent that there was no hard deadline and things were pretty relaxed inside. 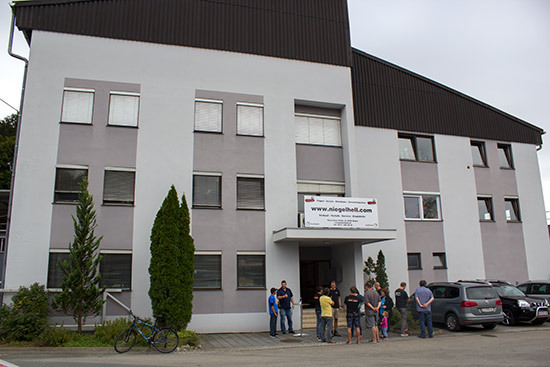 So we took the opportunity to take a look around the building. 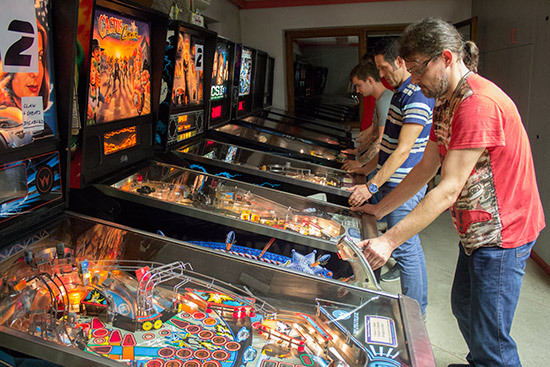 The ground floor is where the majority of the pinballs are located. 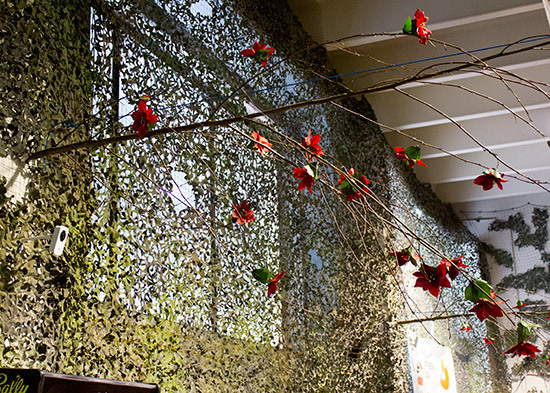 The hall there has been decorated with camouflage-style netting over the walls and windows, and nicely furnished, with sofas, tables, benches and a bar. 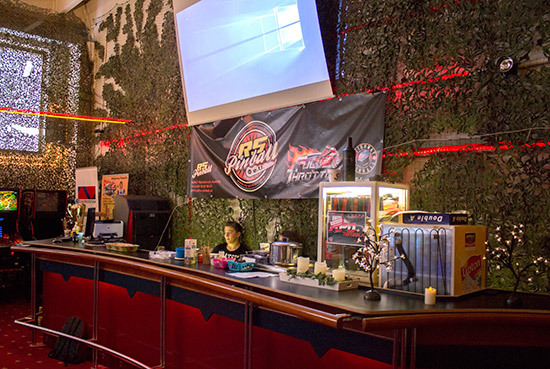 At the front of the hall was the bar which was kept busy throughout the weekend. Prices were pretty reasonable, with a 500ml bottle of the local Puntigamer beer costing €2.20 (£1.60/$2.50), a coffee was €1.50, mineral water €1.00, cakes €1.40, and a hot dog cost €2.50. 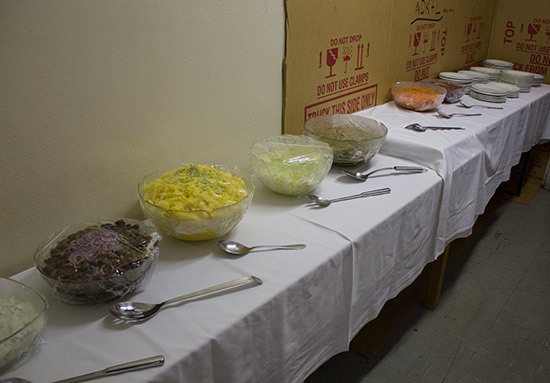 A dining/meeting room is located one floor up, while the top floor was our destination for the warm-up tournament. 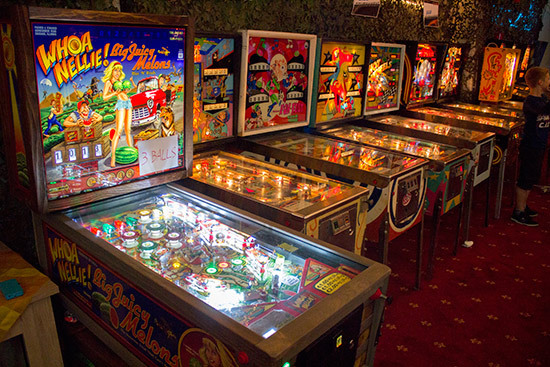 It is here that we find two more pinball rooms. Room 1 is really made up of two connecting rooms, but we'll call it a single room since that's what the organisers did, and it's what's inside that matters after all. It's an impressive sight. 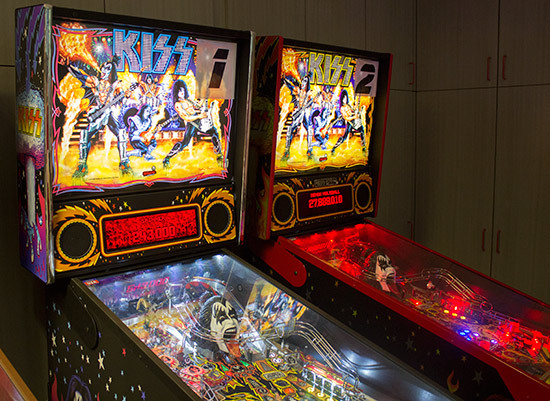 Not just one Stern Kiss machine, but two - a Limited Edition and a Pro. Not just one The Walking Dead, but two - again, an LE and a Pro. 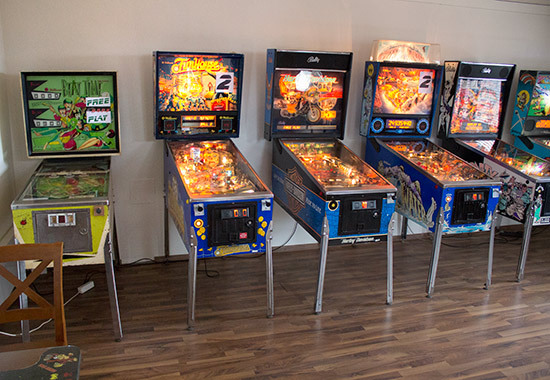 And a WWE Wrestlemania Pro, and a Star Trek Pro, a Transformers, and one of two Heighway Pinball Full Throttle machines at the venue. Go further into the room and there's another row of dot-matrix machines such as Cactus Canyon, CSI, Twilight Zone (one of three) and another Transformers. 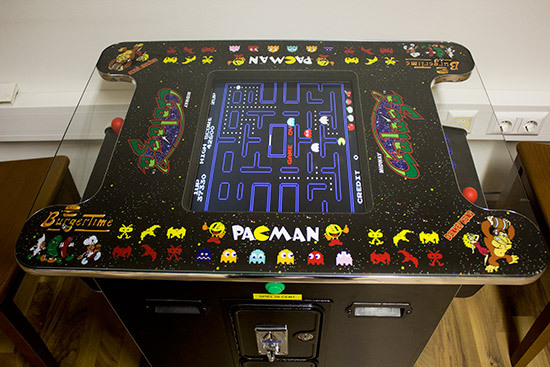 On the other side of the building we find Room 2 which has some older machines mixed with more dot-matrix games. Another Funhouse, Space Jam, Hurricane, Twilight Zone and Whodunnit? 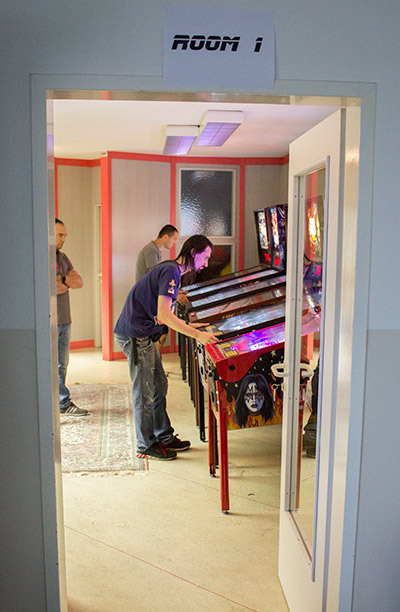 Then it was time for the Warm-Up Tournament to begin, using machines on the top floor. 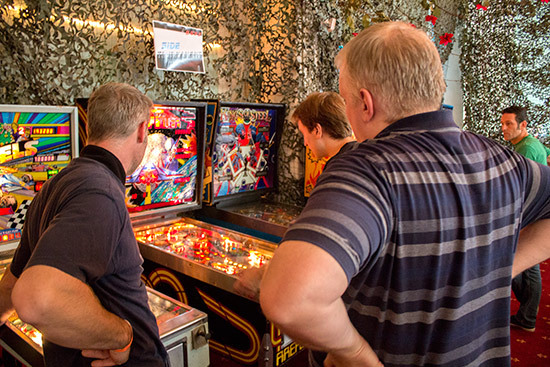 It used a three-strikes Brackelope format, where players are paired up and play a best-of-three match on a randomly selected machine. The loser gets one 'strike' against them, but they continue playing until they get three strikes at which point they are out. It soon became clear that the advertised end time of 11pm was looking optimistic.. 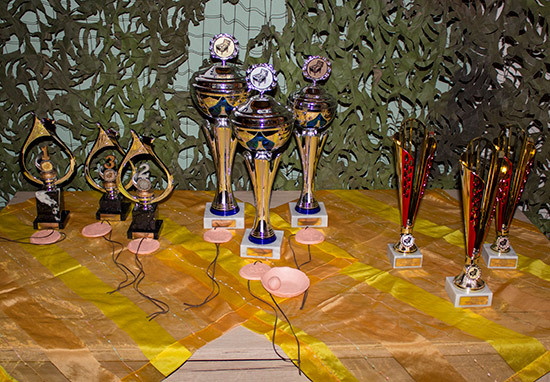 Nevertheless, the remaining players continued playing the format until they came to the last two who would contest the final. 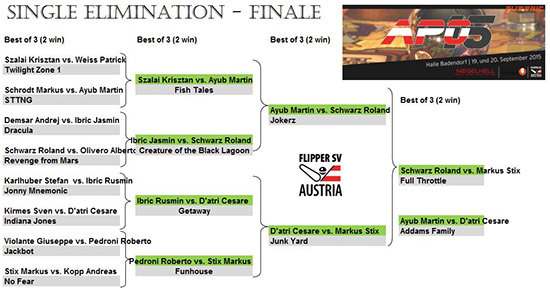 Due to the late running of the tournament, the final took place on Whodunnit? as a single game. 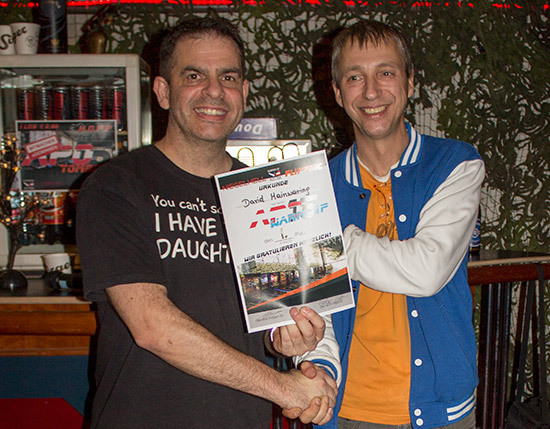 It proved to be a close tie which ended with David as the winner. 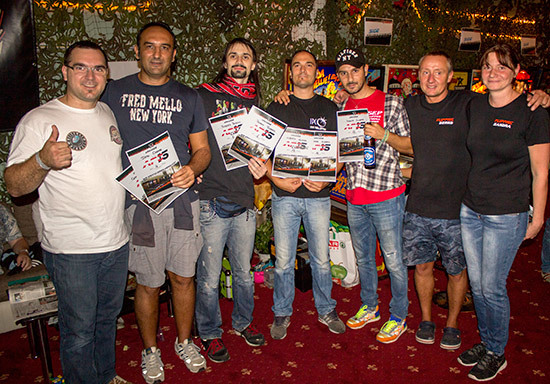 Certificates were then presented to the top three by Gabor Varga. 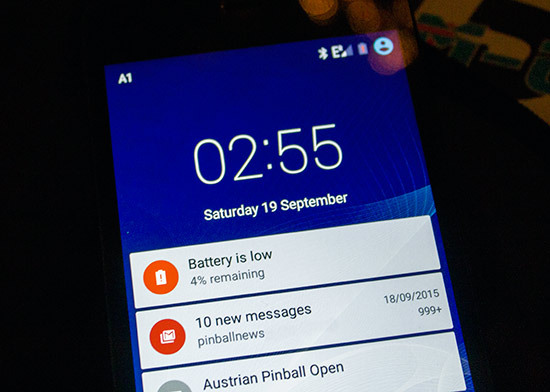 A quick look at the phone showed we had gone a little past the expected finish time of 11pm. 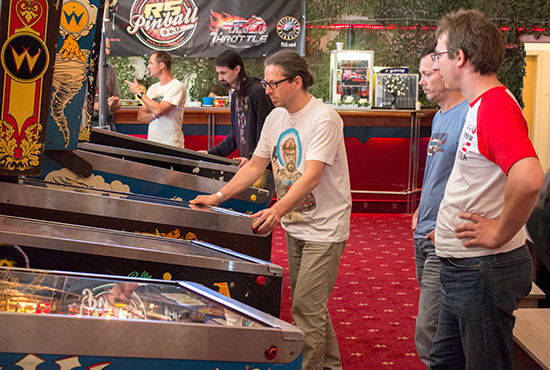 We got to the hotel at 4am, giving us just over three hours' sleep before it was time to get up, have breakfast and drive back to the venue for the start of both the Austrian Pinball Open and the Classic Tournament. 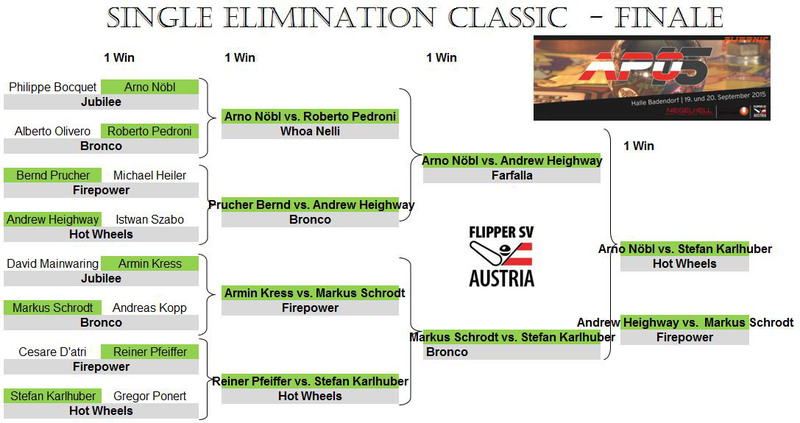 Like the previous night's tournament these are run by Flippnic, - an Austrian organisation for the promotion of pinball - Niegelhell, - the Austrian distributor for many types of amusement companies, including Stern Pinball - and lots of support from Flipper SV- the sports club representing pinball with the Austrian Sport Union. Let's start with the Open tournament. Everyone had to be signed in by 10am for the start of the Open shortly afterwards. 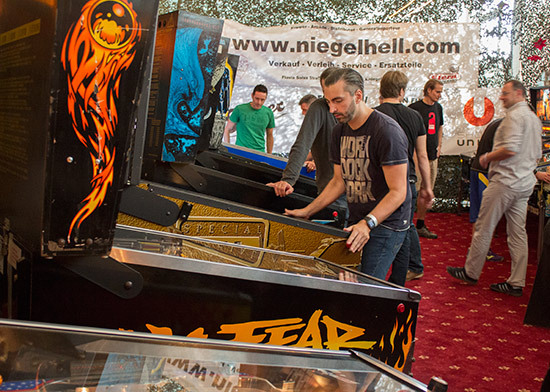 The tournament used the Swiss System where players are paired up and given a randomly-selected machine to play a best-of-three match. 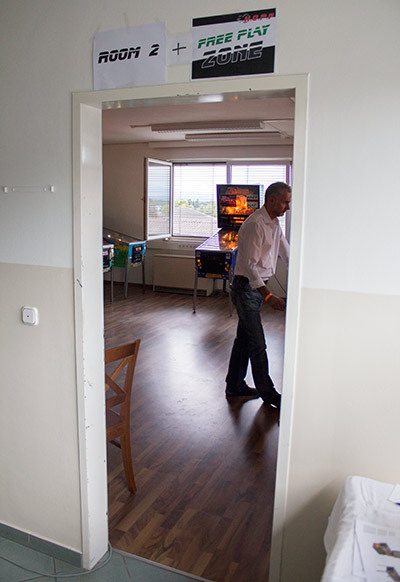 As soon as the next round was announced, players would head for their machines which could be in the main hall or up on the top floor. 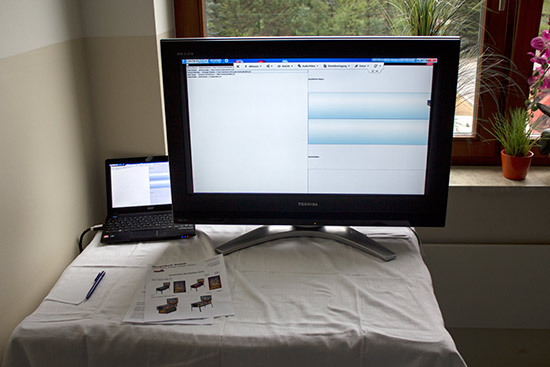 To avoid too much stair-climbing, the display was replicated on a monitor on the upper floor. As soon as a match had been won, the winner would come to the PC in the main hall and enter the result. The list of outstanding matches was on the left, and the winner simply had to click on their match, choose the winner and confirm it. It was a very quick and easy system. Opponents were initially picked at random, but thereafter players with the same or very similar numbers of wins were paired. That meant if you won a match you would move up the rankings and play harder opponents, but if you lost you moved down and played easier ones. Ranking were based on the number of wins but there were also sub-points which showed how you had performed against opponents stronger or weaker than you. If you beat someone who was higher-ranked than you, you got more sub points than beating a weaker opponent. Players with the same number of wins were then ranked by their sub-points scores. 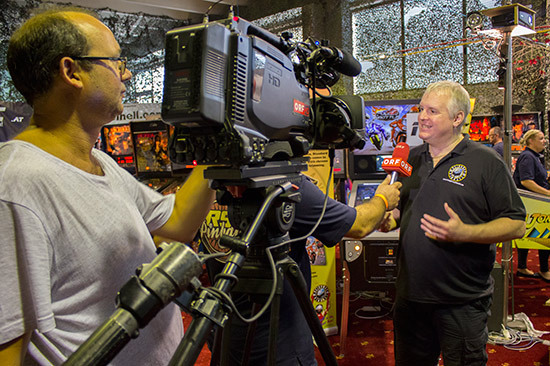 There was a special guest at the Austrian Pinball Open this year as Heighway Pinball head, Andrew Heighway was attending to help promote his Full Throttle game and support his distributor, Stefan Riedler of RS Pinball. At just after 1pm everything stopped for an hour for lunch. 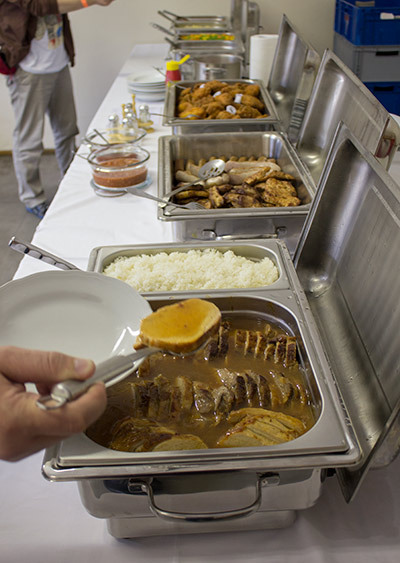 Those who had spent the extra €12 and pre-ordered the lunch meal were treated to a range of dishes which were (by all accounts from those who partook) very well-prepared and amazingly tasty. They certainly looked and smelled nice (sniff). After lunch it was on to the next round of matches. 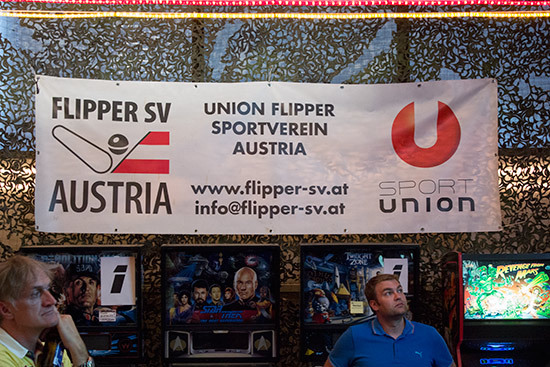 One interesting detail about pinball in Austria is how it has been officially recognised as a sport by the Austrian Sport Union - a fact proudly displayed on one of the banners at the event. 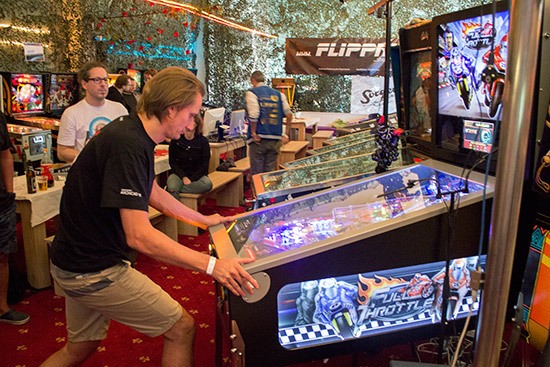 Play continued until around 7pm when the last round was played and the final results of the qualifying stage were known. The top 32 players would continue into Sunday's play-offs. While the Open was taking place, qualifying for the Classic Tournament was also under way. 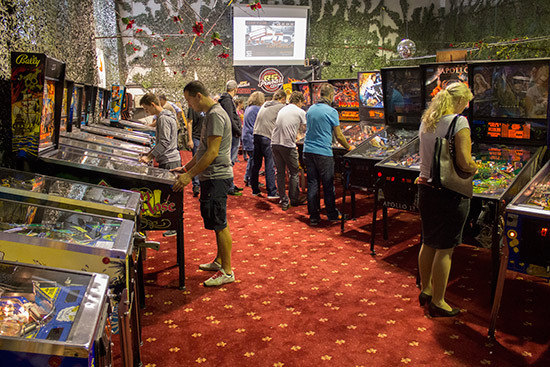 Entry to the Classic Tournament was free for APO players, with each player allowed one game on each of the machines. 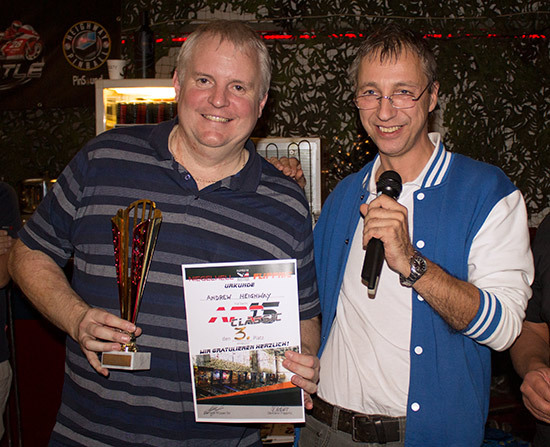 Scores were recorded and, when qualifying finished on Saturday morning, they were ranked with points awarded according to position in the ranking order. The sixteen players with the highest points total would go through to the play-offs on Sunday. 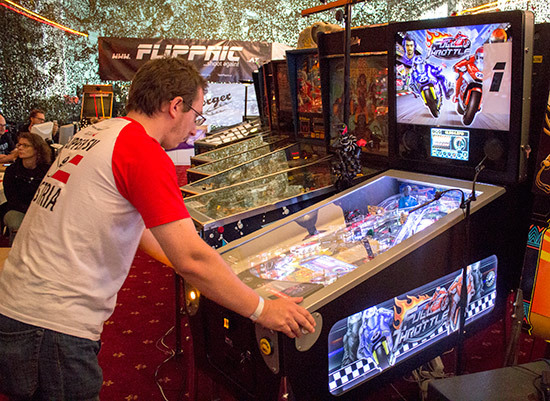 Stardust, Hot Wheels and Jubilee were taken out of the tournament at various points during Saturday after they developed faults, so the qualification was decided on the remaining machine. 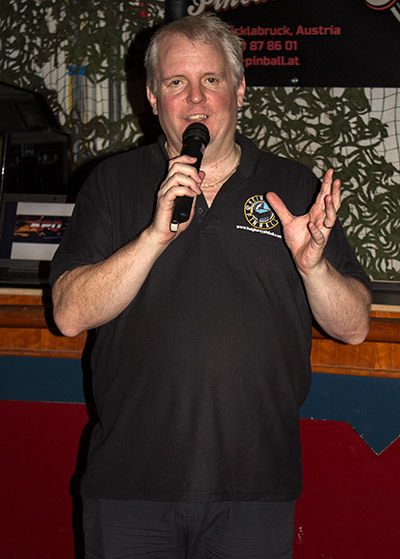 When qualifying for the main tournament was over and Sunday's qualifiers were announced it was time for Andrew Heighway to make a presentation about Heighway Pinball, show some pictures and videos of the factory and the games, and answer questions from the assembled guests. 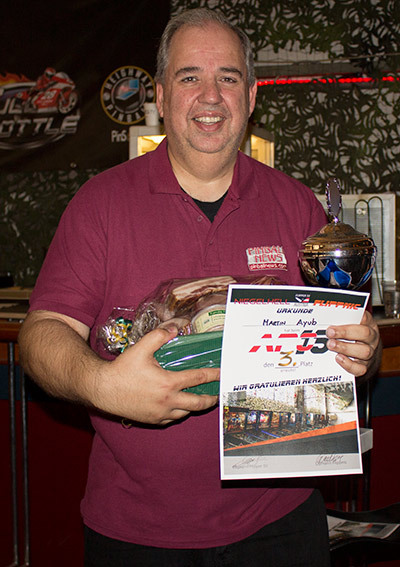 In addition to meeting visitors and answering their questions, Andrew also played in both tournaments. 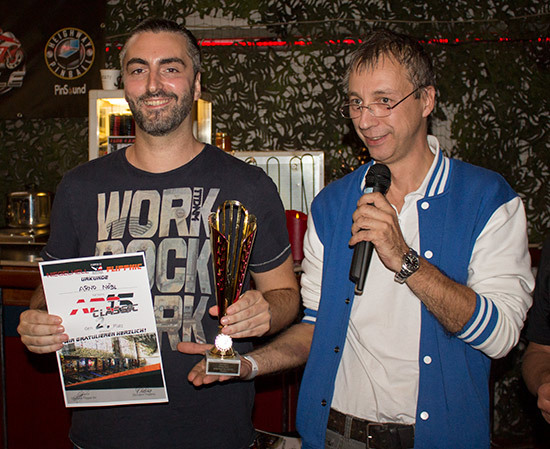 He missed out on qualifying for the Open but easily qualified for the Classic Tournament. 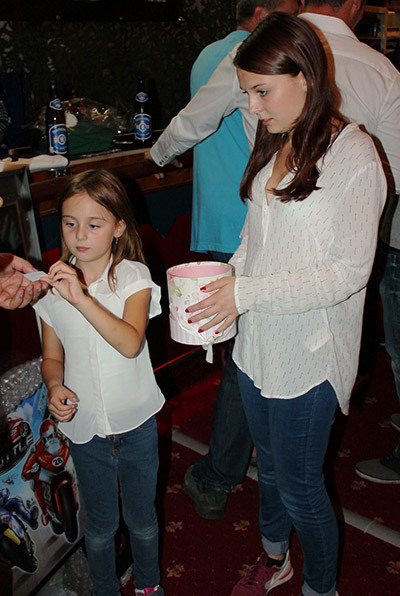 Throughout Saturday sales of tickets for a prize raffle were being sold in the main hall. 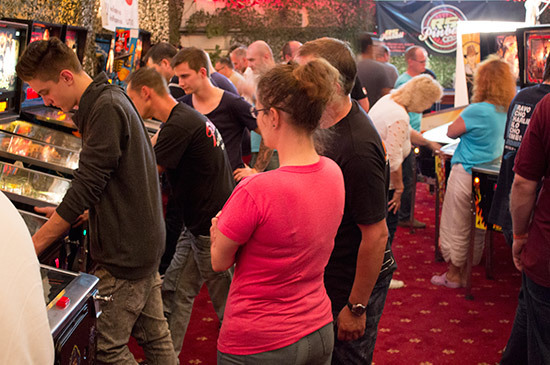 Prices at €2 each, prizes included Heighway Pinball goodies such as T-shirts and a signed translite, prizes from Heighway Pinball distributor Stefan Riedler's RS Pinball, a basket of cured meats, with the main prize being a Funhouse pinball. 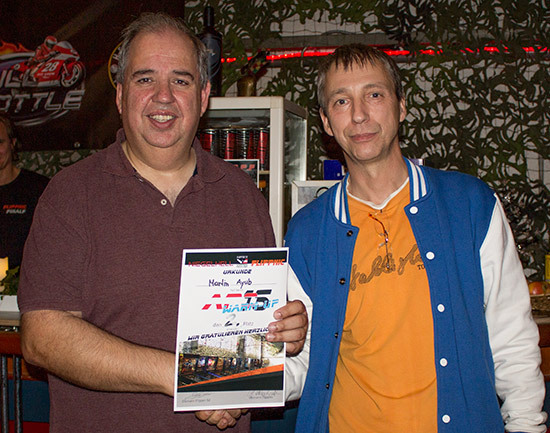 As it turned out, one Rudy was won by another Rudi - Rudi Haferl, who held the winning ticket for the grand prize. The venue then stayed open until late into the night for those who wanted to carry on playing or enjoying the Puntigamer beer. We opted to return to the hotel, get a nice meal and a few drinks at a local restaurant and catch up on our sleep a little. Sunday morning meant play-offs for both the Open and the Classic. 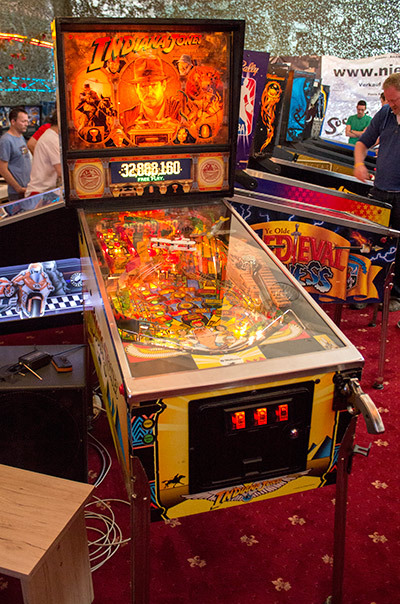 The Open divided the 32 qualifiers into four groups of eight (A-D) and allocated each group a bank of seven machines to play. Three of the banks were in the main hall, while the fourth (D) was upstairs on the top floor. Everyone played a best-of-three match against the seven other players in their group, with the number of wins determining which four progressed to the final. In groups B and D, getting four wins would be enough to progress. In C it was only enough to get into a three-way play-off for two places, while in A you needed five wins to progress. 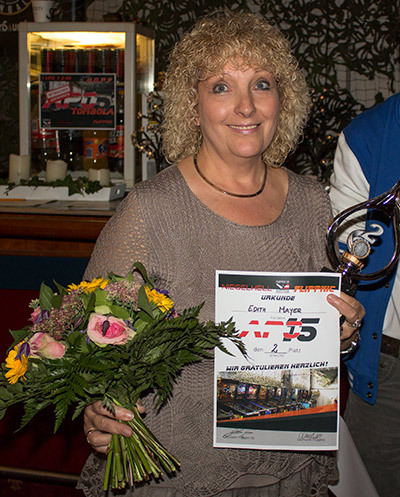 When this round was over and the sixteen players who continued were decided, the play-offs for the Classic Tournament could begin. 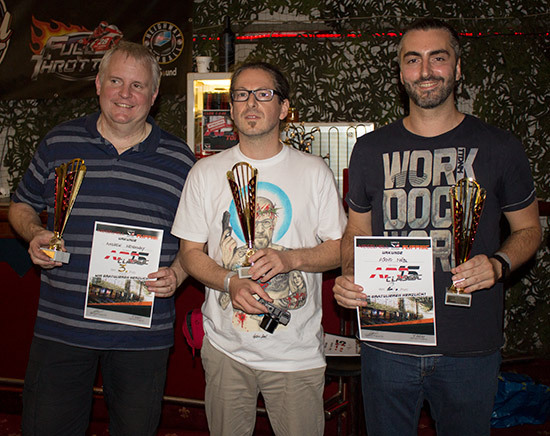 The Classic used a straightforward single elimination format where the sixteen qualifiers were reduced to eight, then four and a final two, with the two losing semi-finalists also holding a play-off for third position. 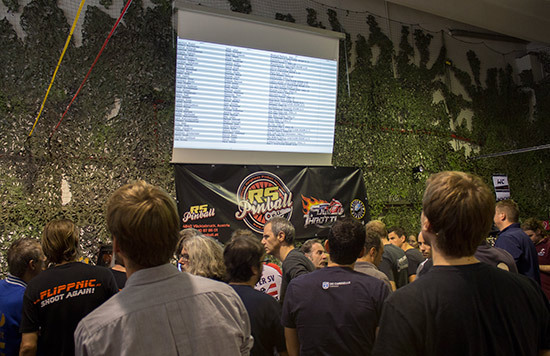 All matches were played on machines drawn at random. The Open used the same format to whittle its sixteen players down to a final pair and a play-off for third place. While we were distracted by playing in the Open and being interviewed for the live web stream, the final for the Classic Tournament was quietly taking place between Arno Nöbl and Stefan Karlhuber over on the row of older games. 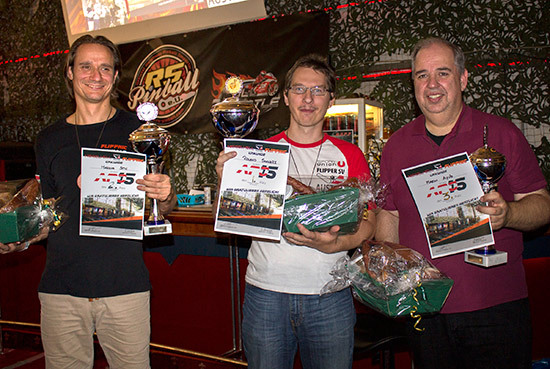 Stefan was triumphant and so won the Classic, with Arno in second and Andrew Heighway finishing third. Then all the equipment was set up for the final of the Open. Like several earlier games, the final was streamed live on TwitchTV, where you can access archives of all the streams. 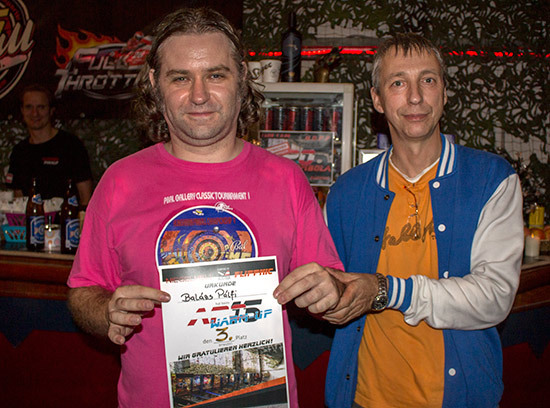 The final was contested by the top two Austrian players, Markus Stix and Roland Schwarz, and would be a best-of-three match played on Full Throttle. Markus gained the upper hand by winning the first game, leaving Roland an uphill task if he was to win the final. Roland turned the tables by winning the second game to level the score at 1-1. 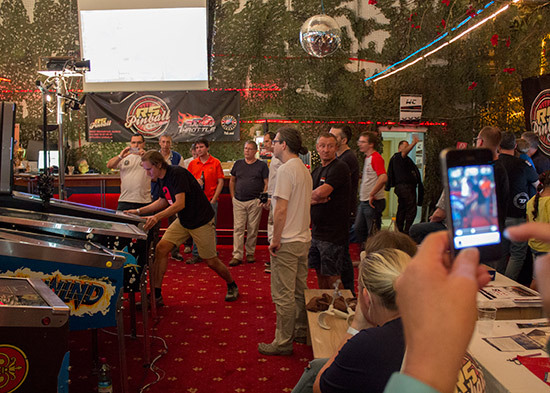 Roland played first on the deciding third game and put up a 15.9M score on his first ball compared to Markus's 8.0M. The game was still wide open. 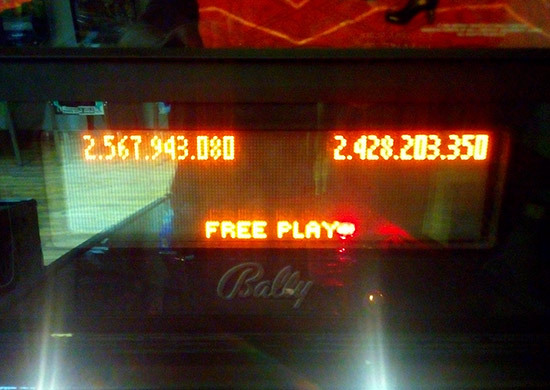 On ball two, Roland bumped his score way up to 84M by starting a series of challenges to get multiball and add balls to increase the scoring multiplier. By contrast, Markus had a very quick drain and only added 1M on his second ball. 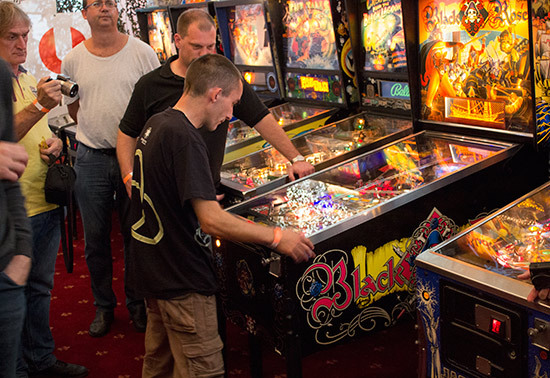 Roland piled on the pressure on his third and final ball by pushing his score all the way up to 152M. Markus had to go for it but sadly he never had much of a chance to attack Roland's score, draining his last ball with just 14.5M on the scoreboard. 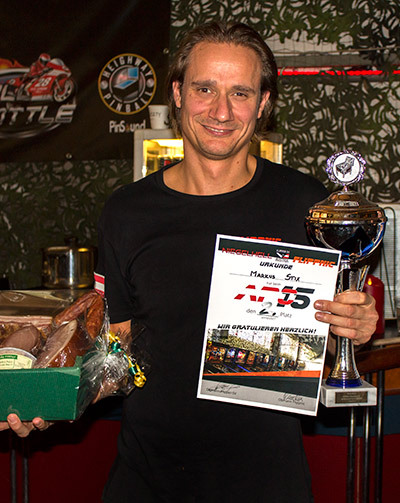 So Roland was the winner. 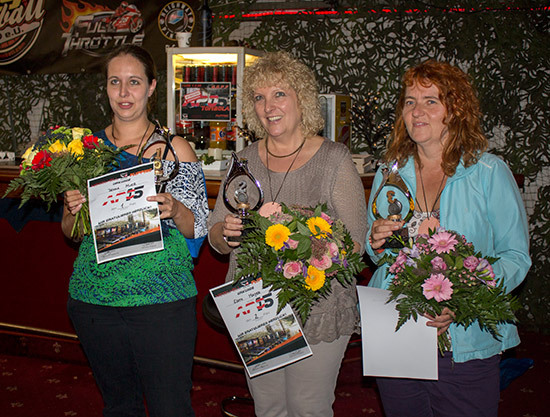 Then it was time for the presentations starting with the Women's Tournament, the results of which were derived from the Open Tournament placings. Next we have the Classic Tournament results. 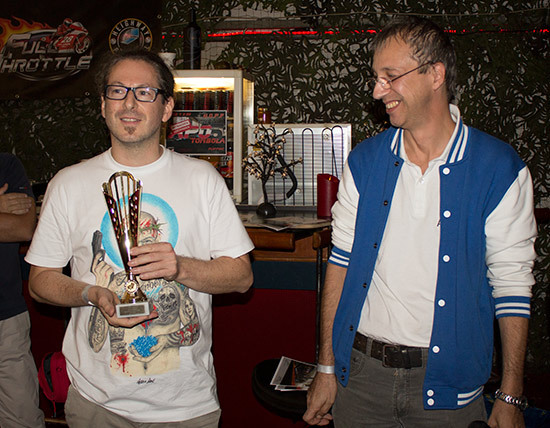 And finally we have the top three in the Austrian Pinball Open 2015, starting with the champion, Roland Schwarz. 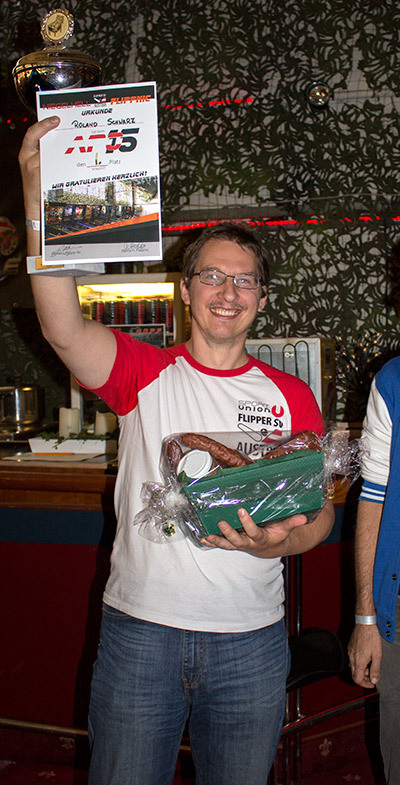 All three Open trophy winners also received a very tasty basket of cured meats and sausages, while everyone who qualified for the final rounds of the Open and the Classic received certificates. Then, with the competitive part of the weekend over, it was time to pose for the last few pictures and to have some fun into the night. 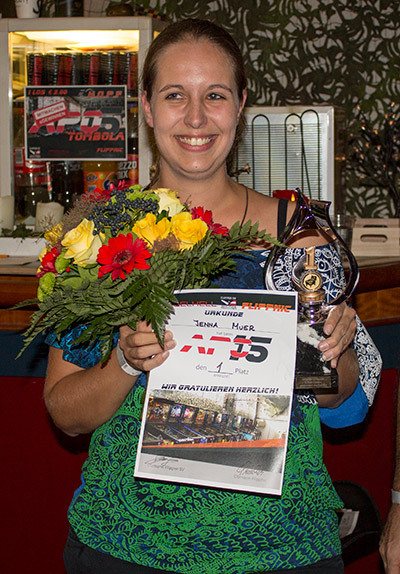 Sadly we couldn't stay any longer as we had to race to Vienna to catch the plane back home, but we have great memories of an amazingly fun weekend held in a magnificent venue. 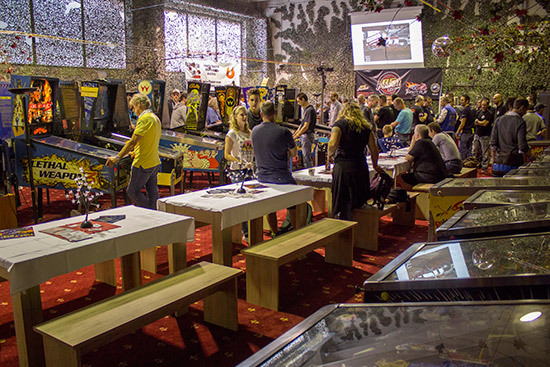 Everyone at the Hall of Pinball-Fame was very welcoming, and the weekend attracted a sizeable number of visitors from neighbouring (and not-so-neighbouring) countries. 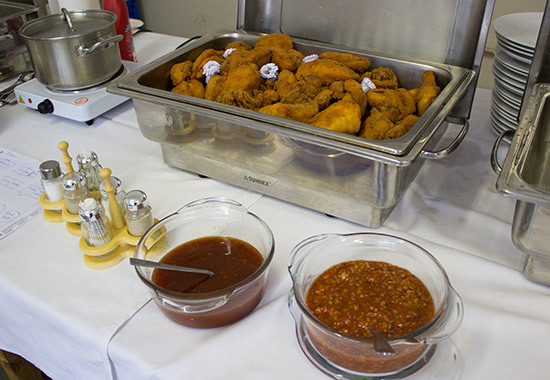 The food was top-notch throughout our visit, as was the selection of machines at the venue. 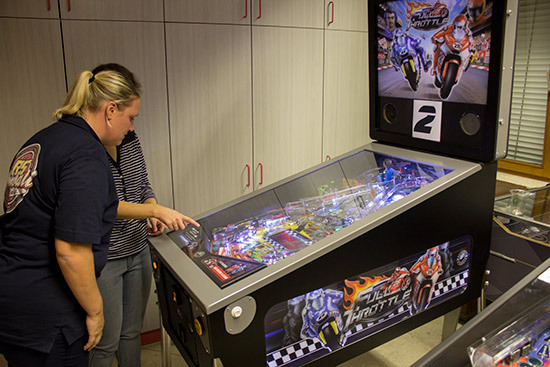 Where else can you play not just one but two of the very latest machines from Stern Pinball and Heighway Pinball? 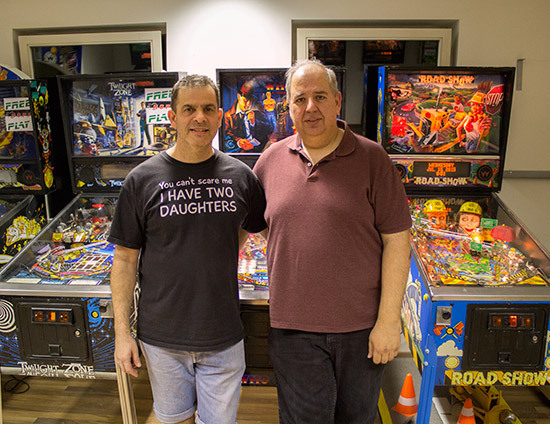 And the even better news is that it is still possible to expand the pinball collection. The netting at the back of the main hall is a false wall, so there is even more room to grow into back there. 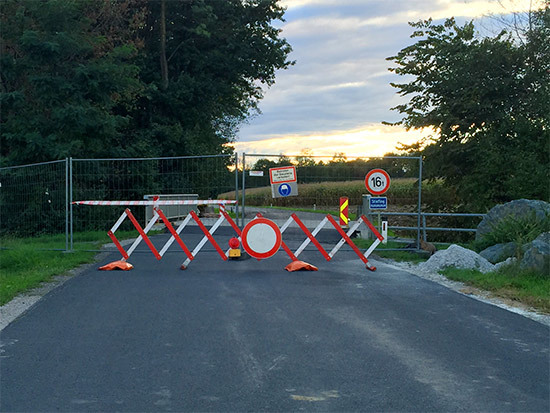 ...which we seemed to encounter every night on our journey back to the hotel, even though we knew where it was and how to avoid it. I swear they kept moving it. 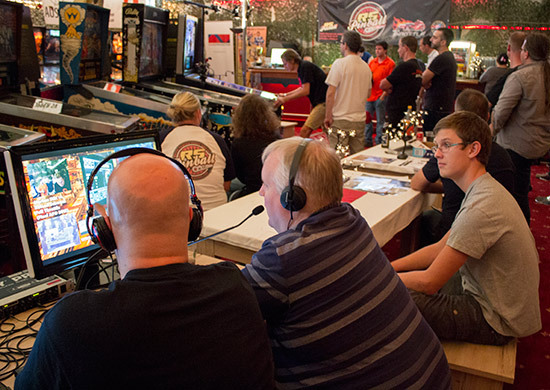 So congratulations to the Austrian Pinball Open organisers. 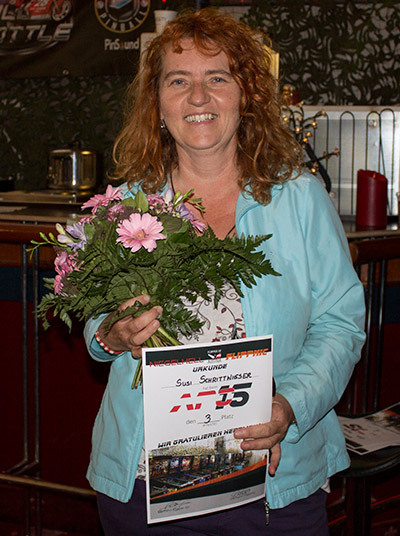 We look forward to seeing you next year for the 2016 edition.